Your first question would be “Why are we reviewing a Ren Faire?” and the second would be “What’s a Michiana, anyway?” Both wise questions, and they will be answered here. This particular Faire is notable for pirates because it is divided into different “realms” for the pleasure of visitors. Since Ren Fairs have largely ceased to be entirely Renaissance themed (at least in the Midwest) and have become places where costume geeks, Doctor Who fans, history buffs and pop culture fans gather to show off their strange clothes and be strange together, it makes sense to divide the area into sections that appeal to different people. Michiana’s sections were Renaissance, Fairytales, Pirates, and Vikings, and therefore the event is of interest to our readers. Mishawaka is a moderately sized city in an area where there is not much else. A beautiful, thriving community, it offers among other things beautiful Kamm Island Park, a tree-lined natural area with wide walkways and lovely trees, located on Kamm Island in the St Joseph River. The Pirate area was located between the Vikings, an area dominated by a recreated Viking settlement which showed off Viking crafts and lifestyle. Between the two were belly dancers. Were these entertainers historically accurate? Not really. But everyone agrees that belly dancers and pirates are two great things that go great together, and with an abundance of dancers, the Pirates were willing to share with their Viking brethren. The Pirate area was definitely dominated by fantasy pirates. Booths hawked broadswords and katanas in addition to cutlasses, and performers were as likely to sing “Sloop John B” (famously recorded by the Beach Boys in 1966) as traditional sea shanties. But it was a happy crowd. Strolling pirates were dressed in tricorn hats and striped pants, garb not inconsistent with real 18th century buccaneers. Calls of “Rum!” and flirtatious looks were common. One gentleman of fortune, calling himself “Captain Duckworth” offered to deliver extravagant complements to anyone on the grounds for a small fee. Pirate offered sword fighting demonstrations, showed (with a huge amount of noise) how black power guns operated and offered a large number of 18th century games in the games tent. I was there too, telling true pirate tales, and offering autographed copies of my books for sale. Non-fiction was definitely the item of the day, with my young-adult books, Pirates of the Golden Age outselling fiction. But Gentlemen and Fortune, my thrilling tale of Scarlet MacGrath, female pirate captain with attitude, came in a close second. Probably the most fun for me, as a performer and vendor, was the large number of folks who came through the area in costume. It’s always a pleasure to see visitors enjoying themselves, and when folks take the time to dress up it means they’re in the right mood to have a good time. In other areas, the Middle Ages and Renaissance were recreated with authentic encampments, dancing and music. And in the Fairytale section, storytelling was king, while folk in fairy costumes sold hand-made goods and entertained children with giggles and games. This was also the place to find the Fair’s most amazing crafts, from one-of-a-kind jewelry to truly unique hand stitched capes. The Fairytale section was colorful and fun. One of the things I liked the least was the amount of trouble given to the Ren Faire by the Powers That Be. The Mayor of Mishawaka came by the let the organizers know that he didn’t like the festival, and several locals showed up with some kind of anger leveled at the “strange people” who were dressed up and having a good time. I should note here that Faire-goers were a well-behaved crowd, and while a local watering hole had organized an on-site tavern, I saw not one person misbehaving or causing trouble. 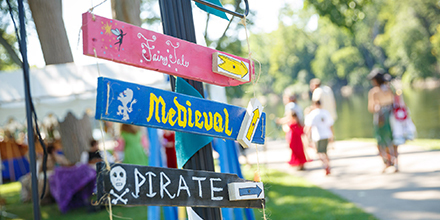 Perhaps it’s a good thing that the Michiana Ren Faire is now looking for a new home. 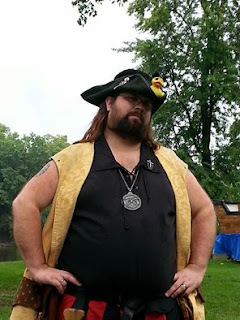 Kamm Island has been a great location, but with the local city government hostile to anyone doing things “differently” the Michiana Ren Faire will be better served by finding a different location. Fortunately funding is adequate, and the core of this wonderful festival’s organizers remain optimistic and full of energy. I’ll be looking forward to the next Michiana Ren Faire, wherever it is. What Did a Pirate Keep in His Chest?